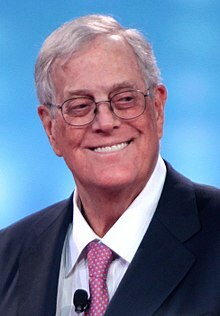 David Hamilton Koch (/ˈkoʊk/; born May 3, 1940) is an American businessman, philanthropist, political activist, and chemical engineer. He joined the family business Koch Industries. He became president of the subsidiary Koch Engineering in 1979. He became a co-owner of Koch Industries, with older brother Charles, in 1983. He was an executive vice president. On June 5, 2018, the company announced his retirement from the company due to declining health issues. ↑ 1.0 1.1 "Koch, David Hamilton (1940)". New Netherland Project. Retrieved August 31, 2010. ↑ Goldman, Andrew (July 25, 2010). "The Billionaire's Party: David Koch is New York's second-richest man, a celebrated patron of the arts, and the tea party's wallet". New York magazine. Retrieved August 26, 2010. ↑ Alex Morrell. "David Koch". Forbes.com. Retrieved 2015-06-10. ↑ "David Koch". Forbes.com. Retrieved 25 March 2015. ↑ Elizabeth Bumiller (January 11, 1998). "Woman Ascending A Marble Staircase". The New York Times. Retrieved August 31, 2010. ↑ NYT staff (May 26, 1996). "Weddings: Julia M. Flesher, David H. Koch". Style. The New York Times. Retrieved September 2, 2010. ↑ Hohmann, James (June 5, 2018). "David Koch is leaving Koch Industries, stepping down from Americans for Prosperity". Retrieved June 5, 2018 – via www.washingtonpost.com. This page was last changed on 5 June 2018, at 21:12.